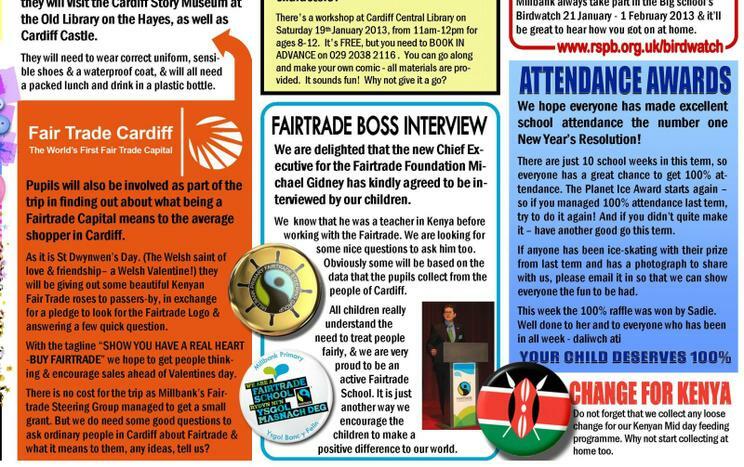 We are so proud to be a Fairtrade school, in a Fairtrade Capital City of the First Fairtrade Nation. 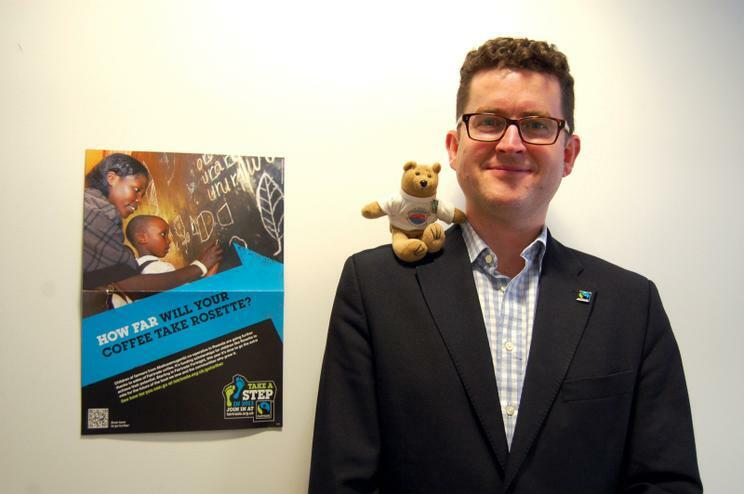 So we were thrilled that the New CEO of the Fairtrade Organisation kindly agreed to do a small interview. We sent up our school mascot Millie Banks with lots of the children's questions. 1. What inspired you to join the Fairtrade Foundation? Trade is the most effective way of ending poverty. Of course we need aid – I feel proud to live in a country with such a strong commitment to development aid. But trade – if it's done fairly - enables people to take control of their own lives and build a more secure future. I began my career as a teacher in Kenya, and it was the power of seeing a bustling town full of entrepreneurs that struck me. Roadside vegetable traders and stone carvers helped me understand the huge potential to transform poverty through trade. 2. 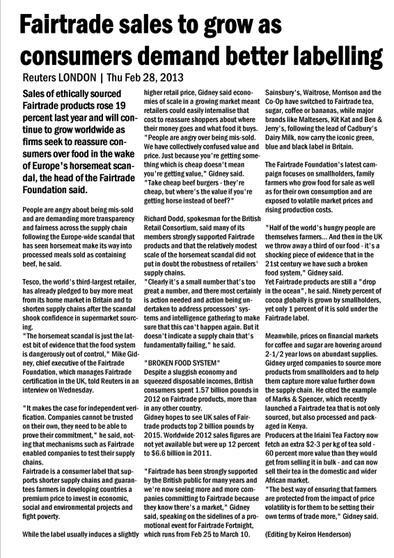 Has the current economic climate affected Fairtrade sales in UK? Has the need for Fairtrade increased? No, in fact we are very happy to say that Fairtrade support is continuing to grow, despite the economic climate which means more farmers, workers and their families can benefit. We announced our most recent sales figures at the start of Fairtrade Fortnight (Monday 25 February) which showed an increase of 19 percent in 2012 over 2011. Fairtrade is swimming against the tide of many commercial trends. More people are choosing to buy Fairtrade products, and that's wonderful. People recognise the work that Fairtrade does and the fact it means when you're sipping your tea or baking a cake with Fairtrade sugar, you know the farmers who made those things are getting a fairer deal. What we'd love to see now is people buying a more varied range of Fairtrade goods – did you know you can get Fairtrade olive oil, cotton wool, peanut butter and even gold and silver? 3. Some of us acted as Flag bearers at the Olympics in Cardiff. 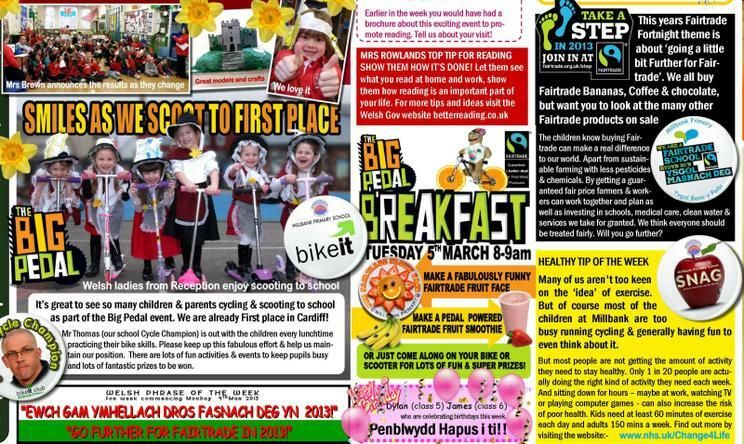 There was not much Fairtrade products and the organisers did not want to talk to us about 'Team Fair.' What impact did the Olympics have on the Fairtrade? It was an enormous positive step that the London Olympics Organising Committee recognised that helping farmers, producers and growers in developing countries was an important way to share some of the rewards from the Olympics with those who need it most. The 2012 Olympics/Paralympics was a great opportunity to showcase this commitment to the rest of the world, and resulted in an estimated 10 million Fairtrade bananas from the Windward Islands and South America being eaten, around 7.5 million cups of Fairtrade tea served, 14 million cups of Fairtrade coffee drunk and around 10 million Fairtrade certified sachets of sugar consumed. This equates to a Fairtrade premium of around £100,000 to invest in social, environmental and economic development projects, like clean water drinking holes, school buildings and medical clinics. That is the kind of impact we wanted from the Olympics – farmers and workers to benefit from the partnership. We are hoping this tradition will continue with the Commonwealth Games in Glasgow in 2014. 4. What goals have you set yourself as Chief Executive, a dad and as Michael? Gosh – that's a lot of goals! My personal goal is easy: I'm very clear that my family comes first. My wife and I have two children (our daughter is 14 and our son is 9) and our hope for them is similar to that of any parents: that they are happy, fulfilled and feel loved. I try to be the best Dad I can be, but that's not always easy when your job often calls for you to be away from home. I try to ensure that my children know I'm always there for them. 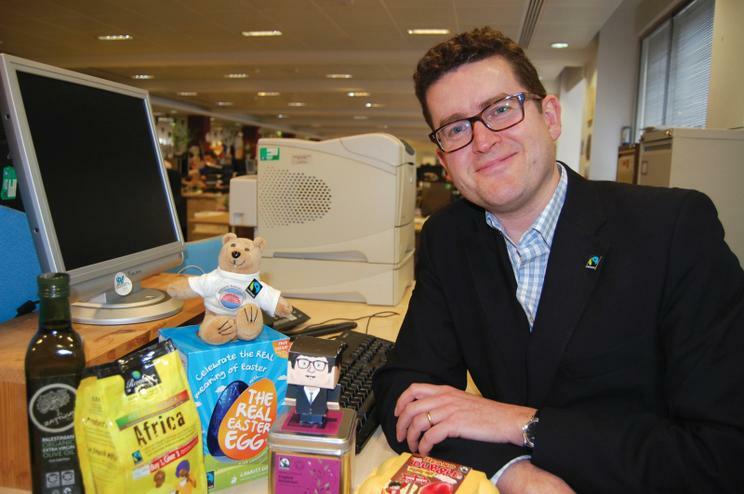 As for my job as Chief Executive of the Fairtrade Foundation, my goal is to ensure that Fairtrade lives up to its fantastic potential. Fairtrade can transform communities and can make such a difference – I want to ensure that we deepen the impact of Fairtrade, reach more people and really challenge every company to be part of this wonderful movement. 5. What is the best and worst part of your job? Best bit – seeing Fairtrade in action. It's a great privilege of this job that I have the opportunity to meet farmers in different countries, to see how they are getting on and to talk to them about how Fairtrade is making a difference. It's sometimes challenging: I was in Kenya in January for example and tea growers there were pushing me on why we can't sell more Fairtrade tea in the UK (we're working on it!). However it's also inspirational to see how Fairtrade is helping farmers in developing countries fight poverty and build stronger communities. We can read more about Fairtrade Kenyan Tea in a nice article in the Guardian from February. It's great to see so many products already in the shops and in our shopping baskets! Of course the more you buy and ask for Fairtrade the more the supermarkets and shops will stock. 6. How does Fairtrade Foundation work with Fairtrade International? The Fairtrade Foundation is the UK member of Fairtrade International (Fairtrade Labelling Organisations International – FLO), which unites 21 labelling initiatives across Europe, Japan, Mexico and Australia/New Zealand, as well as networks of producer organisations from Asia, Africa, Latin America and the Caribbean. Fairtrade works with FLO as the organisation which coordinates Fairtrade labelling at an international level. FLO sets Fairtrade standards, organises support for producers and develops global Fairtrade strategy, which the Fairtrade Foundation is part of. 7. As the BRIC countries and others become richer do you think that there will always be a need for Fairtrade in the world? How do you see it evolving in the future? We will be focusing on trade, and on the need to change policy and practice, until the job is done and unfair trade is a thing of the past. That will take decades yet, but hopefully one day we will not need Fairtrade – the job will be done. 8. What is the most important issue you think schools should look at in Fairtrade? Fairtrade covers a lot of issues, from gaining a fairer price to making sure the Fairtrade premium helps communities and families, and it's wonderful if a school can take the time to look at any of these issues. 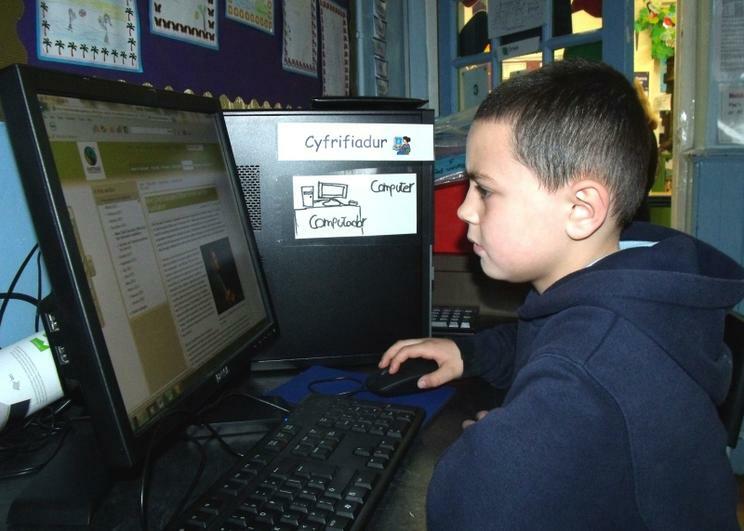 One of our aims is to encourage pupils to think about the products they buy and where they are coming from. We hope learning about Fairtrade will help children and teachers to become informed consumers, as well as learning something new about different countries and those who live there. 9. What is the most unusual Fairtrade product you have heard about? Fairtrade products have become very varied over the years – we've worked hard to try to include farmers and workers from all different sectors. Most recently, we've certified Fairtrade and Fairmined gold, platinum and silver, but some of the more unusual products include Fairtrade wine and beer, Fairtrade jelly beans and Fairtrade cotton school uniforms! 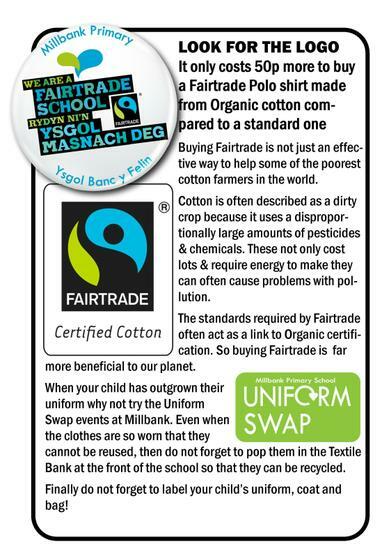 Lots of the main supermarkets are now offering Fairtrade cotton school uniform. At Millbank we supply the faitrade organic cotton Polo shirts with our logo embroided on it. 10. What is the best story about Fairtrade you have heard? There are so many wonderful stories, but I was very impressed recently on a visit to Kenya, talking to tea growers in the Mount Kenya area. The Iriaini Co-operative is a group of 8,000 smallholders, who on their own are poor and have little opportunity to improve their lot. Working together, however, they have improved their quality and have begun to sell their tea on Fairtrade terms, helping them to sell on the international market and secure immediate benefits. This in turn gave them confidence to expand, and so they persuaded the British government and Marks and Spencer to fund a packaging facility for them, so they could not only pick their tea, but also pack it at source. This has helped them make more money from each kilo of tea they pick (60% more), and now their packed tea is available in the UK as well as on the Kenyan market. But even that wasn't enough – they are now working to sell their tea across the East African region. This is a story of hope and energy – proof positive that if you give farmers a better deal, they can race ahead. 11. Some countries build space rockets while people in the country go hungry, should their governments take a more active role in supporting their people? This year we are asking governments to go further for smallholder farmers. Our petition, which began at the start of Fairtrade Fortnight, will be taken to Downing Street on World Fair Trade Day, where we hope David Cameron will take notice and work with other governments at the G8 in order to support smallholder farmers, who are vital to fixing our broken food system. 12. We have links with a Kenyan school in Nairobi, but they had never heard of Fairtrade, how important is it to spread the message in other countries? It's very important to spread the message in other countries, and we try to do that as much as possible in order to help . Fairtrade Africa, our partners there, do excellent work in spreading the word. There are now some Fairtrade products in shops in Kenya including the Fairtrade tea I mentioned above. 13. 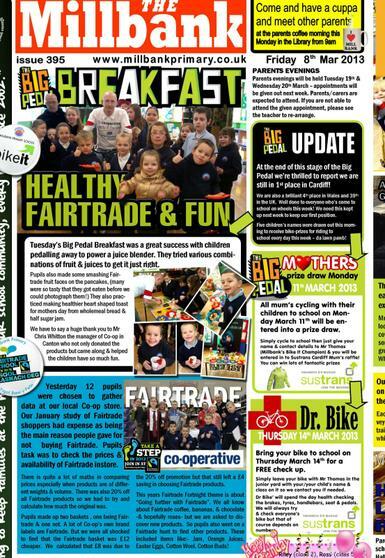 We do lots of work to promote Fairtrade but the local paper is too busy to cover it. But when someone burnt our minibus they gave the story almost a full page. Does the bad news stories harm the reputation of Fairtrade, or is all news good? Fortunately, there have not been too many bad news stories about Fairtrade. In most cases, we will have already taken action by the time problems have been in the news – if we know something is amiss, we will act on it as quickly as possible. However, sometimes there are bad news stories which appear for different reasons – because the person doesn't fully understand, perhaps. Our experience is that honesty is the best policy and we try to be as frank and open as possible with everyone, including journalists. 14. What is your favourite football team? I live in Suffolk so it would have to be Ipswich Town! 15. Fairtrade has helped in working towards the Millennium Development Goals, what do you think the new goals should be in 2015? Perhaps the most important thing would be for richer countries to promise to listen more to poorer ones and really to try and understand what poor communities need to fight poverty. Too often inter-governmental groups try and find top-down solutions to the world's problems. Fairtrade is an example of the reverse, of trying to solve things from the bottom up, from the most marginalised farmer up to the world's largest food companies. That's an approach that would transform the post-MDG agenda. 16. 2012 was the UN international year of Co-operatives how did Fairtrade organisation mark that? During 2012 we worked closely with the Co-operative to highlight the important jobs co-operatives across the globe do. We collaborated in lots of ways – one of which was to convert all of the Co-Op's bananas to Fairtrade! 17. What message would you like us to spread? 18. Are there any plans to celebrate the 21st birthday of the Fairtrade Foundation in 2013? Do you think we should be celebrating Fairtrade coming of age? We do have plans to celebrate our 20th birthday in 2014, which we'll be shaping up this year. Our 20th birthday will be a key part of Fairtrade Fortnight next year, but we'll be keeping everyone updated with what we're doing to celebrate. 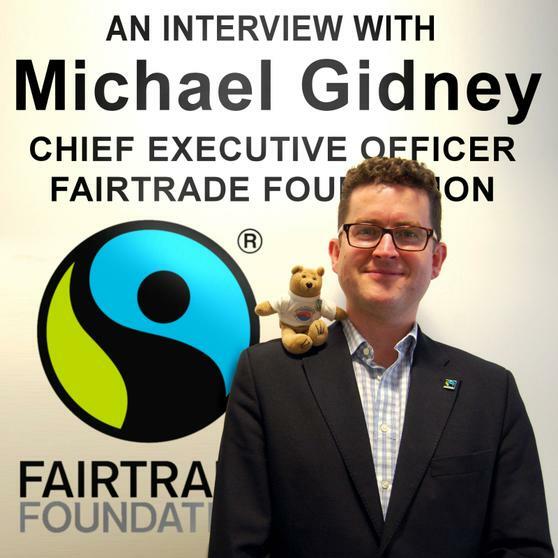 We woulld again like to say a huge thank you to the Fairtrade Foundation for all their amazing work and of course to Michael Gidney and his staff for taking the time to answer our questions.